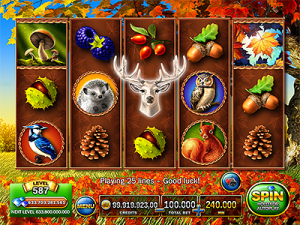 Enjoy the natural beauty of Autumn in this new exciting slot! Experience the new Random Wilds for amazing ways to win! Play on 25 win lines and enjoy two thrilling bonuses! 3 “Mushrooms” Symbols trigger this bonus. 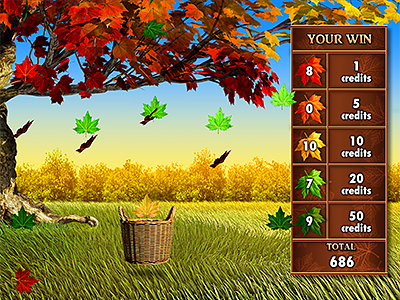 Move the basket to start, and continue moving it to catch the leaves! Catch as many leaves as you can! 3, 4 or 5 “Golden Leaf” Symbols trigger this bonus. Enjoy 5, 15 or 30 Free Spins on special reels! Higher bets award more diamonds! Play maximum bet to unlock all slots fast!